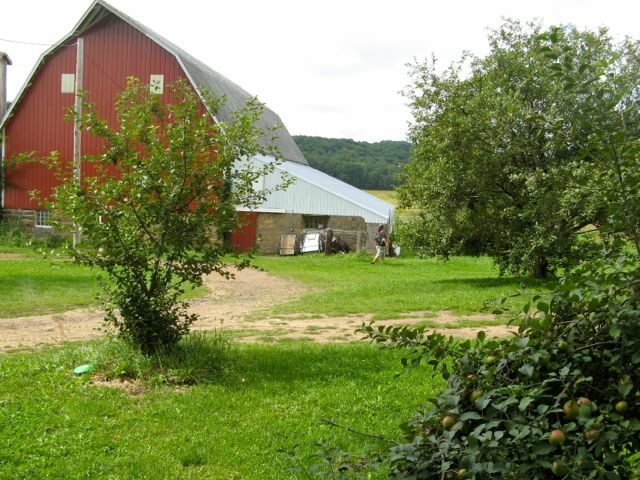 A couple of weekends ago, my friend Charis (horse nut, co-op big wig, low-flyer) and I (fabric nut, co-op big wig, self-professed low-flyer) held our very first writing workshop at her farm in Colfax, Wisconsin, under the auspices of Menomonie Market’s 2011 member-linkage campaign. Charis and I prepared to serve a light lunch, which included homemade bread, raspberries, pesto, carrots, cucumbers, and molasses cookies. We planned to write for an hour or two, break for lunch and farm walks, and conclude with a long writing spell in the afternoon before we talked as a group about what everyone came up with. It’s strange to think that you can just up and invite people to write and eat (or dance or act, for that matter) with perfect strangers, but we Americans seem to do such things all the time. Heck, we took to the flash mob like it was our birthright. We seem to trust that if a woman (or a pair of women) has the gumption to hang a shingle that says “Writing Teacher in the Building,” there will be exciting ideas about getting stuff down on paper behind that door. I don’t know about Charis, but I consider myself a wildly risk-averse person. Therefore, I am at pains to explain why I create so many situations that jolt my system such that I mishear words, jump at the slightest noise, and talk about five times as quickly as normal. I guess you could say that I habitually overindulge in the bookish person’s version of bungee-jumping. “How do I turn myself down?” I thought as my eyes darted around the table. You’ll notice that the verb "to write" does not figure among these words, and for a spell I felt a twinge of guilt about that. After all, if you aren’t writing at a writing workshop, you probably need to examine your focus or work ethic. There certainly should be a critical mass of writing at a writing workshop, but it needn’t be the dominant note in a good writing experience, at least not in my view. We didn’t write much in the afternoon. It’s the thinking that matters; if there is some gem-like thought still in your head as you drive home from a writing workshop, you’re lucky. For me, that gem was a mid-morning conversation. Charis had passed out several containers of spices and herbs, all of which were veiled so that each writer described only what she smelled and where that aroma took her. I drew fennel, and because Linda and Rebecca felt curious about the contents of all those pretty dishes, they smelled this substance and wrote about it, too. As we each discussed where the mysterious little pots had taken us, a strongly anti-fennel block emerged. Licorice, it seemed, was no favorite among the writers. This made me wonder how this bracing, earthy, sweet flavor had come to power, and how its fortunes had eventually turned. My hypothesis is that in the days before sweet products like gum drops and candy bars and fizzy soda pop were everyday lunch and snack items, people’s tongues defined a broader range of flavors as sweet and appealing. Anything, perhaps, that was not salty or bitter, was considered sweet. Sweetness was as much an absence as a presence. These were the days before fruits were available out of season to any but the richest among us, before [/mix/dinnerguest/afruitskeptic_converts "mangoes and bananas"] were washing upon our shores with abandon, the days when an orange at Christmastime was a really big deal. Refined sugar was costly precisely because it required so much work to produce. And its rarity made it more precious and singular. I long for a time when a sugar cube could give me goosebumps. The word "licorice" shares a root with "liquor;" both words allude to the extraction of sweetness from a root, a process of distillation, of capturing the essence of a plant or fruit. It might well have been the intensity of the licorice flavor as much as its perceived sweetness that stoked people’s pleasure centers once upon a time. I am no fan of the pandering writing experience, the one that seeks chiefly to empty the pockets of people chasing a writing dream. Neither, frankly, do I have a ton of patience for consciousness-raising in a vacuum. Feeling is part of writing; awareness is part of writing; but writing is an act that brings together hundreds of strands of emotion, logic, sensitivity, grace, quickness, persistence, and pleasure. Nothing about fennel that I have yet written quite rises to that standard, yet being with a group of people thinking about fennel made it more likely that I would entertain questions and keep worrying that fennel’s breath for a few weeks longer. My ardent hope is that everyone else at the table that morning found a gem like mine sometime during the day. Because we’re all friendly people, we said we did; but the real proof will come when they sit down alone to write on one of these blustery, bright fall afternoons. If they find a gem gleaming somewhere behind their coffee cup, Charis and I can rightly pat ourselves on the backs and make plans for the next heedless, occasionally chaotic, and indisputably well-fed writing experience. I can’t rule out a pencil-wielding flash mob entirely.